Occasionally I get asked how I manage to get so much done. And I snort-laugh to myself. Let me tell you, I actually don't get much done around here. Most days I'm still trying to figure out supper at 5:00 with the kids screaming and toys everywhere. Perhaps it is the nature of blogging to make you look more productive than you actually are. Getting things done is my weak spot. Half of my day is spent playing with the boys and half sitting on the couch and watching them play while I get a chance to think. Both my boys have a bit of anxiety so I don't get much time while they're awake to work on things. Lately I haven't been able to work even when they are in bed because of the Munchkin's nighttime separation anxiety. After the kids went to bed, I used to be able to clean, make myself a mug cake, and sit down to write. Now, I'm up every 30 minutes to an hour to calm down one of the boys. Not my best working and thinking environment. It's been over a week since I last wrote anything here. Right now, that's just where I'm at. It seems a bit silly to be writing a post like this at this point in my life but these tips still help me, even if I am accomplishing things slower than I would like. 1. Use a planner. Writing out a flexible plan for the day is my life saver. I usually give myself some goals for the month, the week, and then write out a more detailed to-do list for each day. When I get a spare moment, I look over it and decide what I'll try to do next. When it's done, I cross it off. Sometimes days will go by without me accomplishing anything on my list except doing the dishes and making supper. Life happens. I always pull it back out the next day and try again though. So many thoughts are floating around in my head that I need to have a concrete list to look at, to bring me back to reality. 2. Get help! The biggest reason I am able to get anything extra done around here is my Hubby. He. is. awesome. We like to tag team with the boys on the weekends. He'll take them for an hour or so and then I'll take them for a bit. It's how we two introverts manage to survive. When I've had an especially tough day or when grocery shopping needs to be done, he watches the boys after he gets home from work while I run out, grab some Starbucks, and wander around Target or a thrift store for a couple hours. I get a break and a chance to shop and think in peace. This usually happens about once or twice a week and I rarely have to go out with both of the boys in tow. I have been known to leave the boys with their grandparents while I run to the store, go to a doctor's appointment, write for an hour, or just need to vacuum. I don't have a very large circle of good mommy friends, but I do have a few good friends that I can call on when family unavailable. Do I feel guilty? Sometimes, but my family needs a clean home and a sane mommy! 3. Lookout for a moment. When I put on the TV, I usually get 1-3 minutes before someone starts hollering for me or one kid starts bothering the other. I can stick some dishes in the dishwasher(until the baby hears), take a few ingredients out of the fridge to start supper, or run outside like a crazy person carrying a can of spray paint and a picture frame. It takes less than one minute to spray on one coat of spray paint so I'm out and in super quick. Of course, I make sure they are safe first and leave the door open where I can hear them. 4. Leave a room better than you found it. I try to pick up a few things as I walk through a room. If I'm taking the boys to play upstairs in their room, I grab some decor I want to swap out and carry it with me to put away. While I'm up there, I make my bed or bag stuff to drop off at the thrift store. Sometimes I make it worse before it gets better but at least something is getting done! 5. Meal planning. I always do better when I've planned our meals ahead. I try and have a meal planned out for each night for a week or two. Depending on how I feel, I can pick which one I want to make each day. I like to have that flexibility. Crock pots are awesome too! None of these tips are really life-changing, but they do help me to focus. On the rare days when I actually follow all of these, I can get a lot done. Sometimes though, there is no meal plan. Sometimes, I've spent time cuddling little boys instead of washing dishes. This week I was sick and ended up with 7 loads of laundry to fold at once. Life happens. Sometimes I choose to let life happen. There are many nights I choose to watch TV with my husband and ignore the blog, ignore the dishes, and usually I end up forgetting the laundry that I planned to fold while I was watching TV. But real life is more important than getting the pictures hung on the wall perfectly or having a perfectly styled mantel so it's ok! 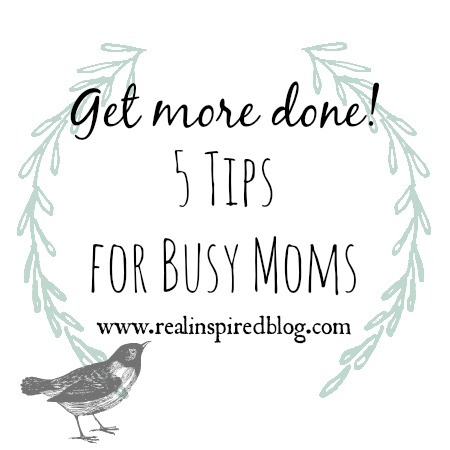 What tricks and strategies to get more done would you add? I need every tip I can get! I'd love for you to share them in the comments below!